It’s late afternoon on Monday so it seems early to write a post for the day but I know everyone is looking forward to hearing how things went. We got up very early this morning. We met our guide in the lobby at 6:30 am. She said that the orphanage is in another part of Beijing and with rush hour traffic she expected it to be an hour long drive. 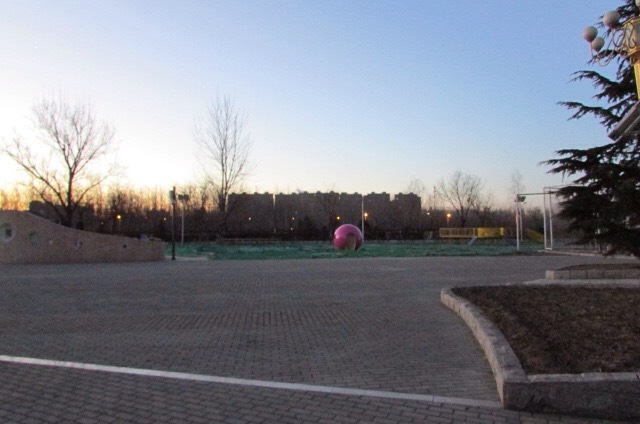 We arrived at the orphanage as the sun was coming up. The lobby lights didn’t even seem to be on but the door was open. We were shown into an empty waiting room. 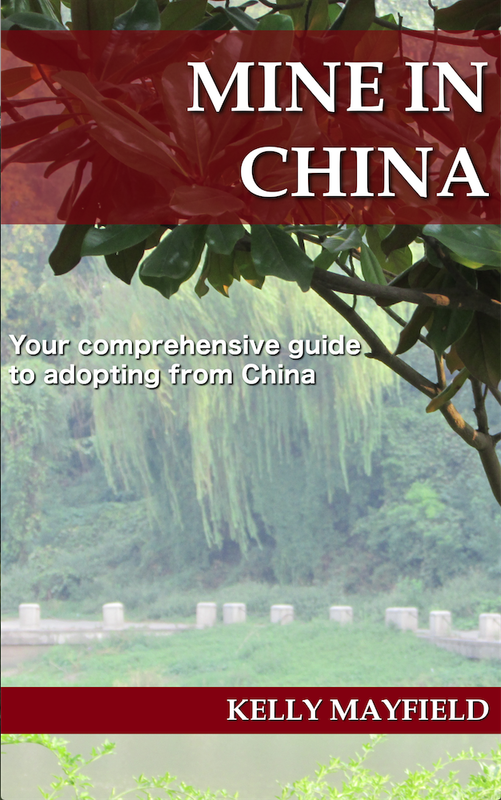 With adoptions from China the policy is that you have a 24 hour “harmonious period” while you have custody of the child but the adoption is not yet finalized. This is to give you a chance to decide if you want to proceed. I had been warned that this orphanage does not practice the harmonious period. I had joked with a friend that we would have a harmonious 20 minutes. What actually happened is that we filled out the adoption paperwork before they even brought August in to meet us! August was brought in by the orphanage director. In all of the photos and over 7 minutes of video we received he is always very serious. He never says a word and we’ve only seen one brief smile. We actually asked in an update request if he could talk but the response was not clear so we had no expectations there. The director set him down with a bag of snacks. She told him to share the crackers with us and he replied back to her! We didn’t hear what he said but it was a two word response. As we spoke to him, and gradually moved him from the director’s arms to ours he remained solemn. The orphanage director and other employee kept talkin to encourage him. They took lots of photos of us together. They remembered that we had brought our other children with us last time. They have 4 boys and are adopting their first daughter. 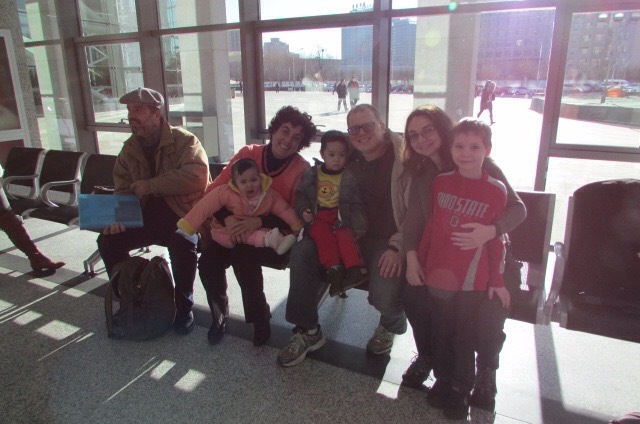 The husband told us that they had applied to adopt from China through the standard process in 2006. They had 3 biological children and one domestic adoption before they were matched from China, all boys. This was their first adoption through the special needs program. The husband is an architect who designs hospitals so he and Matt had a long discussion about the special requirements for radiation departments. Eventually we got to the paperwork part of the visit. When it was time for August to put his handprint on the forms he was very uncooperative. He clinched his little hand into a fist. Our guide kept trying to get him to spread it out. Even after she got the red ink on it, it took several tries to get the handprint onto the paperwork. Everyone chuckled at him. He was happier after we wiped his hand off but he kept frowning at the red ink residue. From the civil affairs bureau we visited August’s finding spot. We then came back to the hotel. Matt went out to get lunch. August had ignored the little bag of toys we brought previously but in the hotel room he was very curious about them. He packed and unpacked the bag, stacked the items, and poked at the carrot nose on Vincent’s small stuffed Olaf. When Matt returned he ate a good lunch. We hadn’t been able to get him to drink anything all day. After trying two different containers we decided to switch to plain water in case he didn’t like the juice. Matt pulled up a website to find out to say “drink water” in Chinese. When August heard the voice from the computer, he looked up and said “drink water” very clearly! He repeated it for Matt when he tried. He actually drank the water too. He handed the bottle back to Matt and made a thank you gesture, kind of bowing with his hands together. This was all very exciting, though he hasn’t spoken since then. It’s good to know that he can communicate. I’m sure he will open up more over the next few days as he begins to feel comfortable with us. August came to us in a very nice outfit. Two outfits if you count the under layer. We’ve peeled off an item or two but when we took off his hat he put it back on again. He smells like soap so he must have had an early bath this morning. When I took his hat off I saw that the back of his head is beautifully round. My adoption friends will appreciate the rarity of that. Now he has taken a long nap and is up and playing again. He is very seriously trying to crack the code of the stacking cups and taking peeks at us when he thinks we aren’t looking. He’s such a brave little guy! There are more pictures on the Flickr site. There is a link to the upper right of the blog. We’ve got the date stamp turned off now! They still aren’t as nice as the ones my mother in law took so I guess we don’t have her magic touch. This entry was posted in Uncategorized and tagged China trip 2016 on January 11, 2016 by minefam. He looks so sweet and sounds so sweet in your description! I can’t wait to hear more about this little guy. I know this is terribly late. I have been very disconnected from the e-social world recently. Congratulations on your little guy! Our son was 2 months shy of 3 when we adopted him in 2013 and he, too, was very stoic at first. He was NOT talking yet, but he started picking up on sign quickly.